In terms of first charter territorial nationals, these are relatively common. 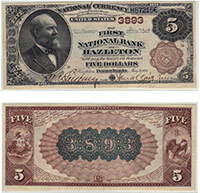 In the scope of all national bank notes they are quite rare. The value is based on the location and rarity of the issuing bank. Of course the condition is also always extremely important. Please contact us if you need a price quote. Don't forget to check the serial number. Number 1 notes always sell for nice premiums.